While Firefox has made very impressive strides, I still use Chrome as my primary browser. It’s due in no small part to the Workona extension, but that’s beside the point of this post. I wanted to talk about one of my favorite little productivity tips for Chrome that doesn’t require any extensions or hacks. Custom search engines allow you to type an abbreviation, hit tab, then type a query to jump straight to the search results on just about any site that has a search tool (so just about any site). Here’s a step-by-step for adding a time-saving search. As an example, I’ll show how to add a search for instantly finding the best literary quotes about a topic using the GoodReads quote search. Open Chrome preferences (use ⌘-comma like an adult). Scroll down to the Search Engine section and click on Manage Search Engines. You’ll notice that Chrome has already saved a lot of searches you’ve run in the past. You can click the dots on the right side of any of these to edit the keyword to something short and access your previously-used searches conveniently. To add your own custom search, click the Add button next to the Other search engines header. 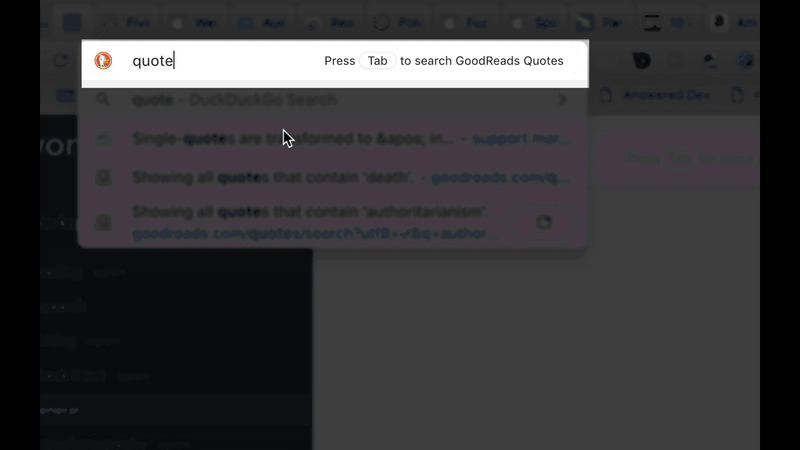 Now when you jump to the URL bar (again, use Cmd-L instead of clicking like an animal), you can just type “quote authoritarian” to search for quotes from your favorite writers. I use the Adobe Stock Photos site quite a bit, so I created a custom search for stock [query] to run those quickly. As I mentiond, I freqently use bt [query] to search my site using a DuckDuckGo site-specific search (in this case with a bunch of extra query settings). In most cases you can just type a space instead of using Tab, so the simple act of typing “quote death” would automatically initiate the search. If you didn’t mean to start a custom search, for example if you meant to send the word you typed to the default search engine, just hit backspace and it will restore the word and cancel the custom search. You can also use custom search engines to create site-specific searches for DuckDuckGo or Google: for example, if I want to search my own posts using DuckDuckGo, I type “bt”, hit Tab, and then any keywords I need. This executes a site-specific search sorted by date with the URL https://duckduckgo.com/?q=%s&sites=brettterpstra.com&sort=date. Got your own gems for Chrome, or want to talk about how you accomplish this on other browsers? Your comments are, as always, welcome below.